On Wednesday night, Sisters Uncut made headlines as 14 activists stormed the red carpet at the premiere of the film Suffragette. If you don’t know who we are by now, you’d better take note. 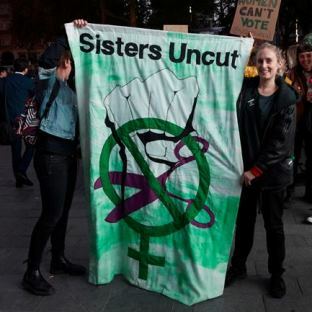 Sisters Uncut was formed by a few women who had witnessed the reality of the government’s cuts to domestic violence services, and decided to fight back. From the start, this group has been nothing less than incredible. At its heart are the politics of intersectionality: an understanding of the overlapping barriers that women face (racism, sexism, immigration status) and a real passion to create an inclusive, loving and bold community as an alternative to those structures. We are not the same but we have so much in common. What we have to share is our anger. Two women are killed each week in the UK by their current or ex-partner. The violence is increasing, and yet our government is cutting services for survivors. 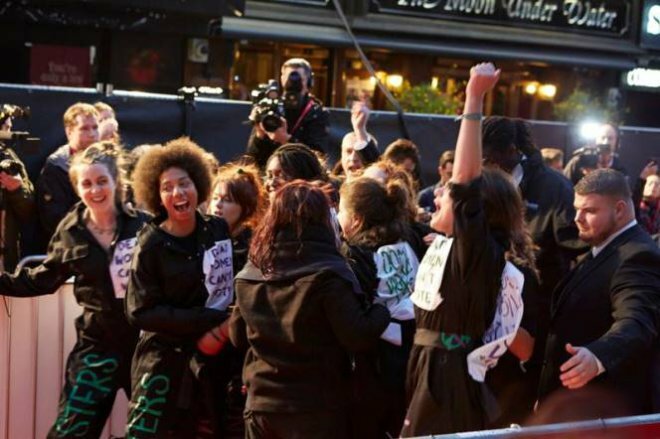 Since the group’s inception less than a year ago, Sisters have shut down Oxford Circus on a busy shopping day, occupied the roof of the London Council’s building, burned copies of the Daily Mail outside of their headquarters, and now forced their way into international news by crashing the red carpet. And this is only the beginning. On that red carpet, Sisters took a stand. We took back space – a space that has predominantly been reserved for women to discuss the dresses they’re wearing, we were instead shouting at the tops of our lungs. And we will not be silenced. Cries of “David Cameron take note, dead women can’t vote!” were heard above the gentle string music which accompanied the stars as they strolled up and down the carpet. As the film’s supporters celebrated the UK’s (whitewashed) history of feminist activism, the Sisters were there to say that this fight is far from over. Austerity has slashed refuges, spaces for women fleeing violence, along with benefits, social housing and legal aid that are all lifelines for women who are dying to escape dangerous situations. Specialist services providing support for LGBTQ+ and BAME people experiencing interpersonal violence are hit the hardest, and always the first to go. A total of 32 specialist refuges like these have closed between 2010 and 2014. Sisters Uncut are not taking this quietly. Austerity is not a necessity; it is a political choice. It is a sexist and racist choice. With each direct action our group is growing. Stop looking to the past for nostalgic accounts of a struggle for women’s rights – the struggle is now. And dead women can’t vote. We are on Facebook, Twitter and Instagram. Pictures courtesy of Sisters Uncut, photo by Claudia Moroni.